A terminally-ill five-year-old boy has died in Father Christmas's arms after having his final wish to see Santa Claus fulfilled. 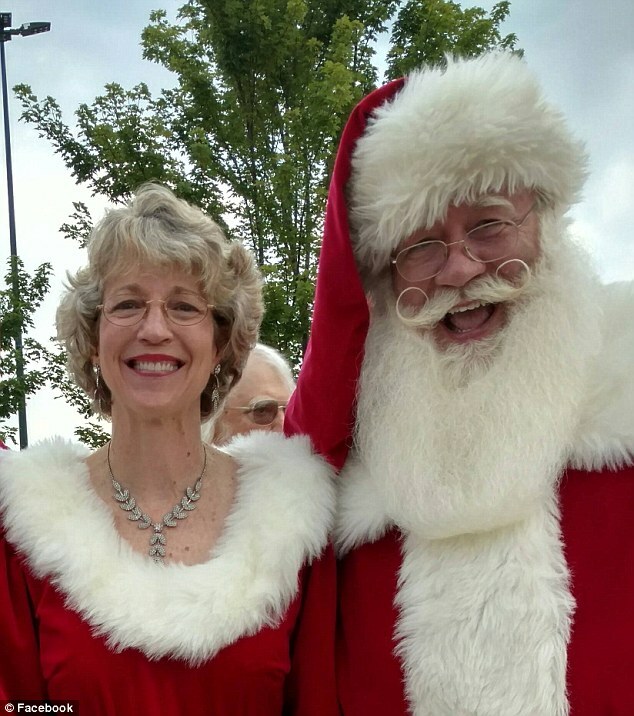 Eric Schmitt-Matzen plays Santa at 80 different gigs every year, but it was one boy in a Tennessee hospital who he will never forget. Schmitt-Matzen, a mechanical engineer and co-owner of Packaging Seals & Engineering, had just gotten home from work just over a month ago, when he got an urgent phone call. It was a nurse who worked at the hospital where Schmitt-Matzen, 60, often spreads joy and Christmas cheer. The nurse said there was a 'very sick five-year-old boy' who wanted to see Santa Claus, Schmitt-Matzen told the Knoxville News Sentinel. He told the nurse he would change into his suit and come right away, but she said the boy didn't have much time left. Fifteen minutes later, Schmitt-Matzen arrived. The boy's mother held out a toy from the popular children's show PAW Patrol, and asked him to give it to her son. 'I sized up the situation and told everyone, "If you think you're going to lose it, please leave the room. If I see you crying, I'll break down and can't do my job,'" he said. 'When I turned around, where is everyone? Already outside, crying in the hallway,' he told DailyMail.com. As the boy's relatives watched from a window looking into the Intensive Care Unit, Schmitt-Matzen walked inside and saw the boy. 'He was laying there, so weak it looked like he was ready to fall asleep,' he said. Schmitt-Matzen assured the child that he was, and then gave him the toy. The little boy then had a big question for Santa. Schmitt-Matzen then asked the little boy to do him a 'big favor'. 'When you get there, you tell them you're Santa's Number One elf, and I know they'll let you in,' he told the boy. 'They will?' the child asked. It would be his final words. 'I wrapped my arms around him. Before I could say anything, he died right there,' Schmitt-Matzen said. 'He was in my arms when I felt him pass. 'I kinda looked up in the air, and tears started coming down my face,' he told DailyMail.com, choking up again at the memory. Schmitt-Matzen said everyone outside the room then realized what had just happened, and the little boy's mother ran into the room screaming. 'I handed her son back and left as fast as I could,' he said. 'I spent four years in the Army with the 75th Rangers, and I’ve seen my share of (stuff). But I ran by the nurses’ station bawling my head off. The entire experience completely rattled Schmitt-Matzen, who cried the entire drive back home. 'I even had to pull over a couple of times,' he admitted. 'My wife and I were scheduled to visit our grandchildren in Nashville the next day, but I told her to go by herself,' he said. 'I was a basket case for three days. It took me a week or two to stop thinking about it all the time,' he added of the experience, which occurred more than a month ago. Schmitt-Matzen was so affected he even considered leaving Santa Claus behind for good. But he dragged himself to another show, and remembered just what had inspired him to wear Father Christmas' suit in the first place. 'When I saw all those children laughing, it brought me back into the fold,' he said. 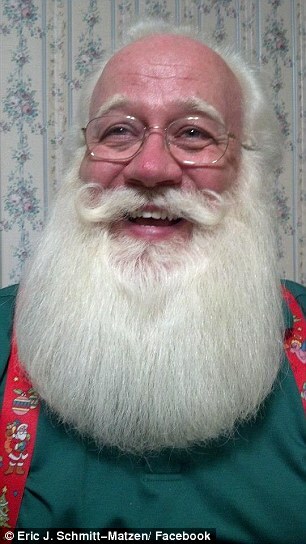 Schmitt-Matzen said that he knew many people who had played Santa for decades without ever having to make a deathbed visit. Yet, since putting on his jolly red hat and coat six years ago, he has made no less than four - including one adult who wanted to knock 'a picture with Santa' off their bucket list. But this was the one that has stayed with him the most. 'This one hit me a little harder because he died in my arms,' he said. 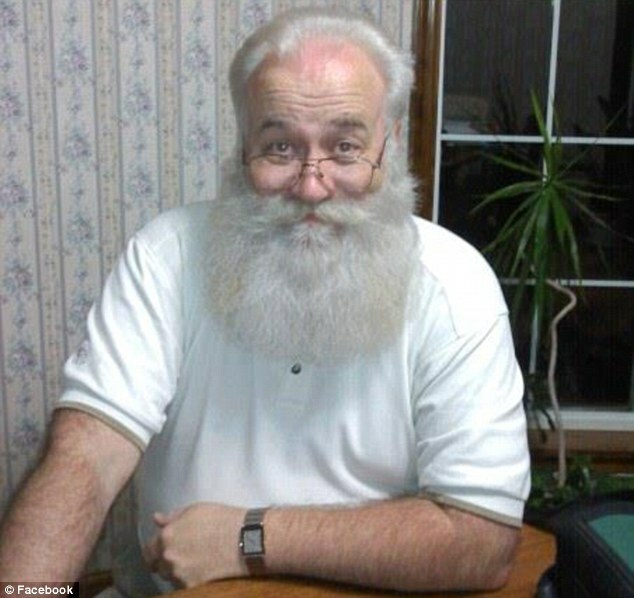 Schmitt-Matzen said his second ever Santa request had been to make a deathbed visit. '(The grandmother) was crying so hard I could barely understand her when she called,' he said. Schmitt-Matzen had visited the hospital room of her granddaughter with his elves and Mrs Claus, but when he walked in last, 'all the (medical) alarms in that place went off' as the sick little nine-year-old girl spotted her hero. He had spent time with the youngster, as his elves and Mrs Claus entertained the family. She died a short while after. The 60-year-old said that often, terminally ill children are more upset about missing their next Christmas than they are about the difficult concept of death. 'The kids know they are going to miss Christmas which is a fun time for them. That has them more worried about missing Christmas than dying. Yet, while he says he says he is always willing to do whatever is necessary to make a little boy or girl's last wishes come true, he has deep admiration for the Santas that 'do nothing but go to burns units and children's hospitals' to visit the sick and dying. He added he was 'too empathetic' to be able to do that everyday without taking the tragedies he'd seen home with him. 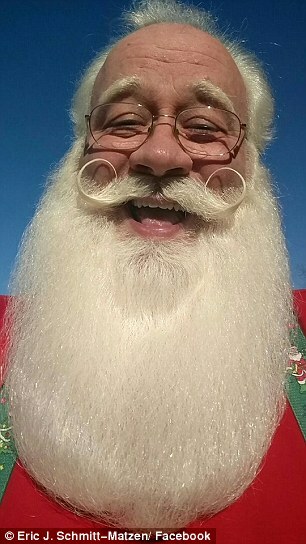 Schmitt-Matzen said he decided to become a professional Santa six years ago, after agreeing to play him for his local church. 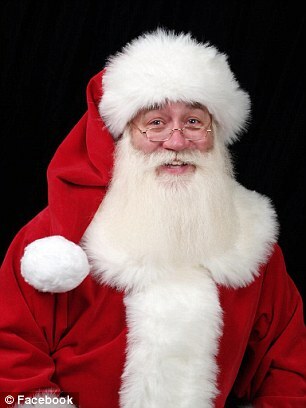 He even studied at 'Santa School' before he was allowed to become a fully fledged Santa Claus. Since then, he's been growing his long bushy beard for the role, although he says there have been the odd 'mishap'. 'I burned half of it off burning leaves,' he admitted, adding that children sitting on his lap also have a tendency to pull on it. 'After each season it's pretty beat up. Even when he's not in costume, Schmitt-Matzen's 'cotton candy' beard and twinkly eyes earns him plenty of double glances - even in the summer months. 'It makes for great conversations,' he said. You meet people you wouldn't have seen before. 'Sometimes you'll catch kids looking at you. And when they catch you looking them look down. 'I'm like, I saw you looking,' he said with a chuckle. 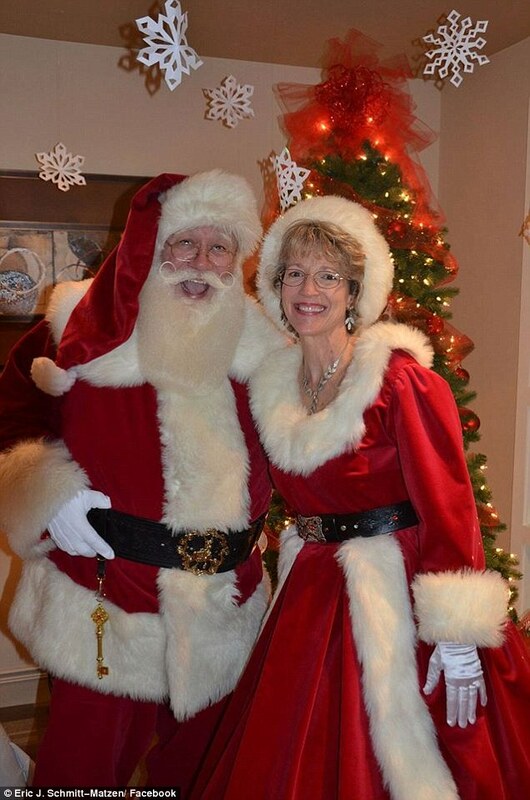 Schmitt-Matzen added that when he and his wife Mrs Claus, aka Sharon Byrne Schmitt-Matzen, went on a trip to Alaska, they stopped for close to 4,000 pictures. 'People can be walking down the street, and they wave to Santa. 'I was walking through Downtown L.A., to visit my daughter, and some of the gangs were sitting out there. 'And they all wanted to take a photo with me. I like to see them walk away laughing.